Last week in Sunday School we talked about the Abrahamic covenant, the promises that God makes to Abraham about his posterity in Genesis 17. We know that God does not just make covenants with men but that he also makes them with women and as we talked I couldn't help but wonder where Sarah was when all this was going on. Later that afternoon I went home and started to read Genesis 17 closer and I was so excited to realized that the covenant God is making is not just with Abraham but it is also with Sarah. Every man child must be circumcised (17:10-14). The covenant will be with her posterity(17:19). 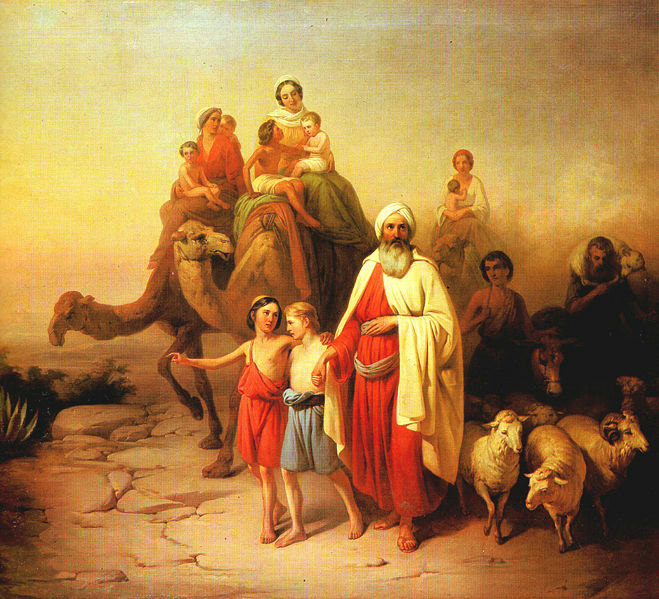 The only two things that are realy different about the promises God makes with Abraham and the ones he makes with Sarah is that with Abraham he promises lands of inheritance (which has to do with his role as patriarch) and he establishes the law of circumcision with him, which is obviously only something that concerns men. Besides those two things the promises that God makes to Abraham and to Sarah are pretty much identical. Having a better understanding of Sarah's part in the Abrahamic covenant sheds new light on the story of Hagar and Sarah and Ishmael and Issac. Even though Ishmael was Abraham's first born he could not be heir to the covenant blessings because he was not Sarah's son. God has covenanted with Sarah that the blessings of the priesthood would come through her; she was heir to all the blessings just like Abraham was. It is really powerful to me to realize that the Abrahamic covenant wasn't just with Abraham but also with Sarah. This really makes a lot of sense because the covenant that God made with Abraham and Sarah was called the "everlasting covenant" and promised eternal increase. Today in the LDS church we believe that couples whose marriages are sealed in the temple are partaking of the "new and everlasting covenant" (which is outline in D&C 132) and that one of the promises is eternal increase, or eternal posterity. The covenant today is "new" because we are in a new dispensation and because the covenant no longer involves circumcision ( which is no longer needed because of the resurrection of Christ). God is the same yesterday, today, and forever and it makes sense to me that if today the "everlasting covenant" is made with couples then in Abram and Sarah's day it also would have been made with couples. The promises of Abraham, Issac and Jacob are also the promises of Sarah, Rebekah and Rachel. Wow, that is a powerful story, thanks for sharing. Where did you learn about the lack of need for circumcision due to the resurrection? Or I can try to find it myself, but if you know off the top of your head, please share. Wow,thank you for this post. I have been studying the record of Sarah and Abraham,especially Sarah for my "Women in the Scripture's" study. ( I used to think that to submit implied weakness,but I know that the perfect example of submission is the Savior to Heavenly Father).She was faithful,even until the end of her days, recognizing that the birth of Issac wasn't the end,but the beginning. I was impressed to reconsider my own life in the gospel, and to continue to grow in my faith,and trust in God at all times. Sarah's life and example is a sure proof that Heavenly Father listens to all of our prayers and answers them in due time. He wants to give us the desire's of our hearts,those very desires that he has written on the fleshy tablets of our hearts and most of all He knows who we are. Thank you Heather,what a great woman of God you are. This is so simple when you think about it. Of course the Abrahamic covenant is made with Abraham AND Sarah! But, for some reason we all just think it's with Abraham because of the name. Thanks for this post! And because women bare sons and then have to decide whether to circumcise them or not, you can totally justify writing about it on your blog! As I read this, I think about my study on women in the BoM, and that even without the specific verbiage about Sarah, the thematic elements of the covenant imply that they also involve women...you can't have posterity (or blessings for posterity), sons, nations, a 'fruitful' life without marriage. Where are these blessings Abraham received? They come only to those who have a temple sealing and marriage. A man cannot become a “father of many nations” without being sealed to his wife. Likewise, Abraham could not hold the right belonging to the fathers without a wife who had the right belonging to the mothers.